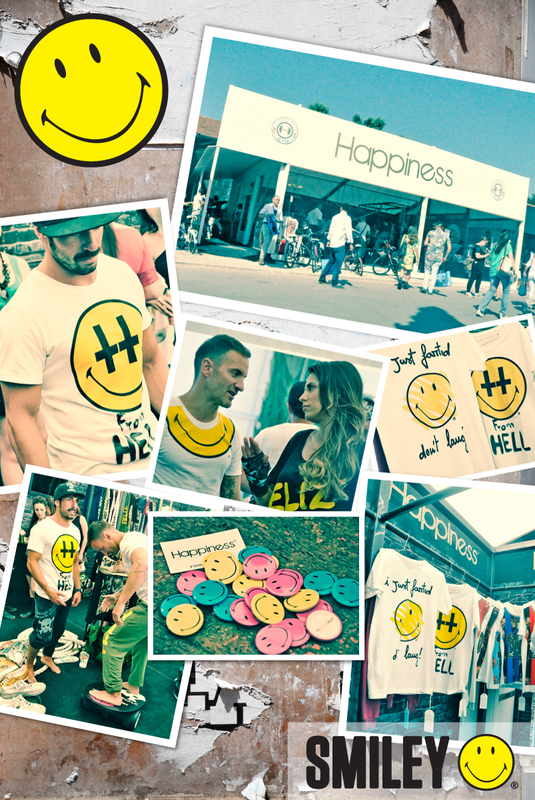 Streetstyle fashion brand ‘Happiness’ gives Smiley the ‘Made in Italy’ treatment. Smiley is no stranger to fashion collaborations. A new edition to the edgy fashion partnerships of the year is with Italian uber-cool brand, ‘Happiness’ – a street style leader in Italy. The premier launch for this collaboration was at Pitti Uomo in Florence, the leading fashion trade show which is been a launch pad for many successful brands in the past, and where the smiling yellow face got the chance to show for the first time his smiley t-shirts. Happiness has prided itself on being innovative and original – much like our iconic Smiley. Their stand concept at Pitti was a perfect illustration of this; delivering crowds of onlookers for a real demonstration of Krav Maga, the Israel self-defence martial art with the Italian actress Elisabetta Canalis. Now that’s original! Smiley Original and Pull&Bear spring summer collection out now in all P&B shop worldwide! Off the back of winter success with a pastel pink Smiley Original Sweater, Pull & Bear join forces with Smiley for a second season. The new capsule collection comprises bold yellow rolled-up sleeve with the signature smiley eyes and mouth and a white hemmed vest top presented with the iconic original smiley logo. Both pieces retail for €12.99 and are due for launch in the end of May; just in time for the summer seasons. Pull & Bear, an established retail chain based out of Spain now has over 800 stores across the globe. The Smiley range is internationally available and once again demonstrated the ability for the Smiley brand to transcend boundary and demographic with universally appealing products. ‘The trend right now is all about yellow and the smiley face. We think it’s here to stay and our most recent retail partners seem to agree. To have Pull & Bear on board for this co-branded range demonstrates their belief in our brand.’ Says Nicolas Loufrani, Smiley CEO. ‘To be selling across the globe via such a respected retail brand enhances our credibility and enables us to share the Smiley philosophy further and further’. Discover more Smiley Style clicking here.